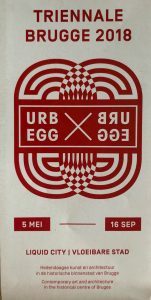 Bruges Triennial 2018 contemporary art and architecture exhibition brings a new layer of excitement to Belgium and the already magical city. 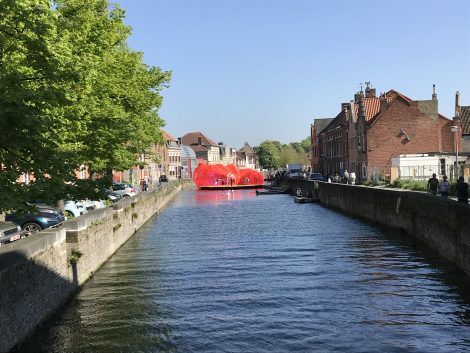 For the rest of summer—until mid-September—visitors to Bruges can enjoy not only the city’s constant pleasures (enchanting canals, medieval buildings, chocolate, beer and terrific restaurants), but also an exciting array of contemporary art and architectural installations. The city invited 15 artists from around the world to create and install works based around a theme titled “Liquid City.” Complex and multifaceted, the theme refers not only to the canals flowing through Bruges, but also to the resilience and flexibility of the city as it moved through time as well as to the changes, uncertainty and fluidity of the modern world at large. Artists interpreted the theme in a broad variety of ways, placing works in surprising spots throughout the city, many actually in canals or waterside. Although all of the installations are worth close viewing and conceptual understanding, some particularly capture the heart. 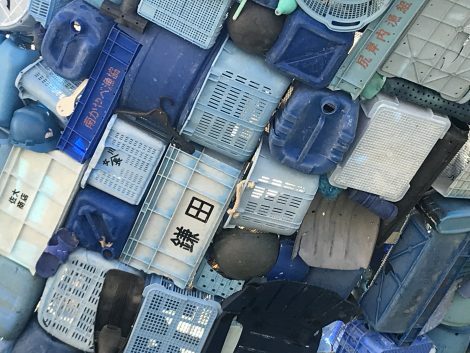 Lesley Chang and Jason Kimoski, the husband/wife principals of StudioKCA, an architecture and design firm based in Brooklyn, New York, installed Skyscraper (The Bruges Whale) to draw attention to the millions of tons of plastic waste and trash polluting the seas and oceans of the world. 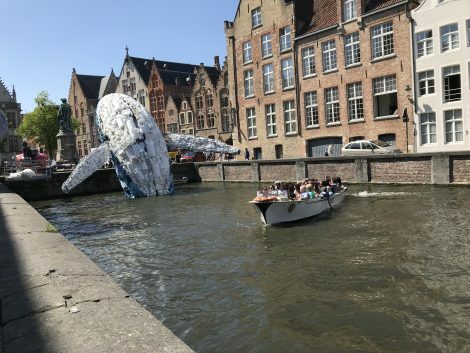 The Bruges Whale breaches out of the Bruges canal symbolizing whales that rise from the world’s first “liquid city,” the ocean. To construct the whale, the artists worked with volunteers to retrieve five tons of waste plastic from the Pacific Ocean. After cleaning the plastic, artists attached pieces, mosaic style, to wire mesh covering the whale’s steel and aluminum skeleton. 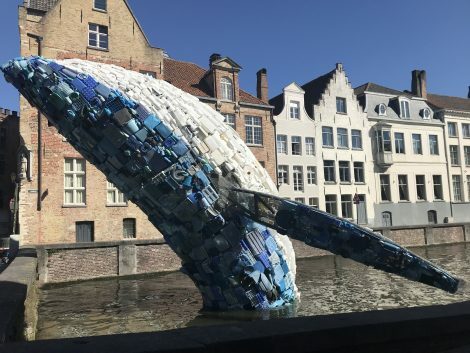 In addition to pleasing the imagination, the artists hope their whale increases public awareness of the 150,000,000 tons of plastic waste swimming in our ocean water today. It’s a walkway, swing set, hammock—a totally fun and visually intriguing sculpture in which to stroll, picnic, meet friends, hang out. The Floating Island installation from architects Sojung Lee and Sangjoon Kwak, of OBBA (Office for Beyond Boundaries Architecture) in Seoul, Korea, goes “beyond the boundaries” of the expected. 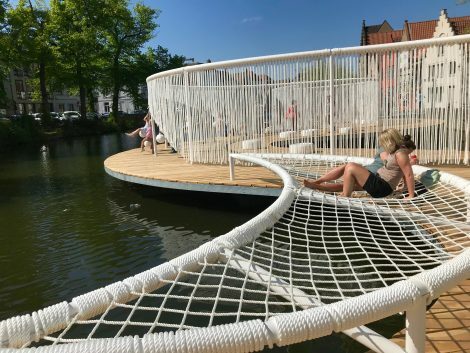 This graceful sculpture of elastic ropes and netting sits on a curvy platform directly in the water at the side of a canal, accessed by stairs attached to the sidewalk. The white structure serves multiple purposes. As tall as the canal is wide, the ropes form tilting walls guiding folks along the curvy pathway. 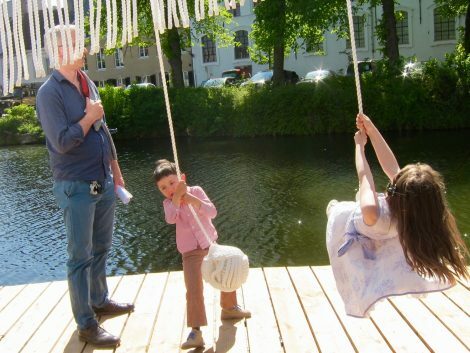 At various spots the ropes coil into seats for swinging or just sitting and sunshine relaxing. Horizontal netting provides a comfortable pallet for lounging. 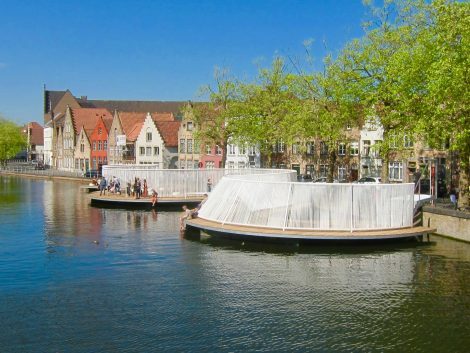 Part sculpture, part playground, the elegant Floating Island enchants locals and visitors alike. Aglow with vivid color, the Selgascano Pavilion comes from José Selgas and Lucia Cano of SelgasCano, an architectural firm based in Madrid. 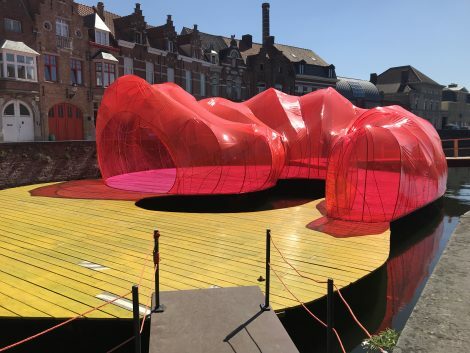 Made from a translucent plastic skin stretched over a steel skeleton, the pavilion’s bubble like tunnel tops a sunshine yellow platform that floats in the canal. A ramp from the street and a gangplank gives the public access to the structure. 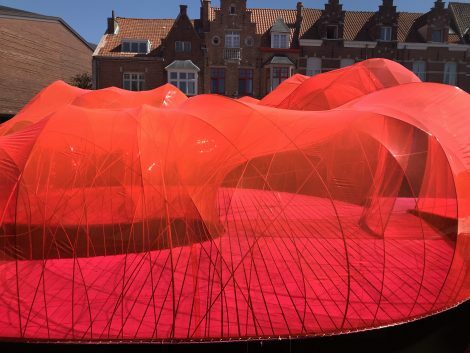 In stark contrast to a backdrop of Bruges’s Gothic brick buildings, the pavilion glows with color that changes from oranges to pinks in different natural light. In addition to being a visually stunning, navigable walkway, the pavilion offers space where visitors can, on weekends, dip into the canal for a swim.